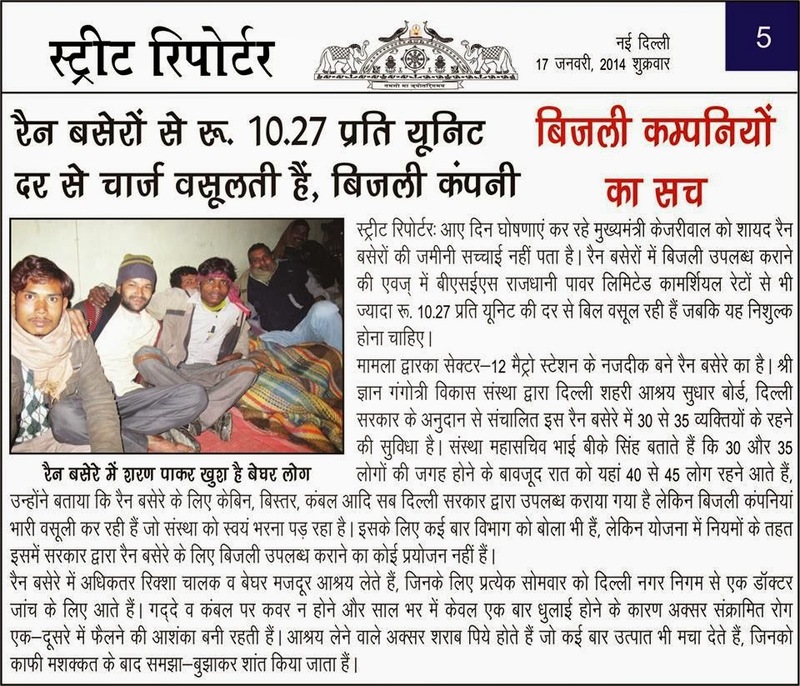 We the residents of East Delhi, strongly object to the Pressure Techniques being applied by BSES, by threatening a blackout of upto 10 hours a day from 1st February, i.e. tomorrow. We are paying our Electricity Bills on time & BSES or any other utility has no right to harass the public for their personal gains. Let the CAG Audit may come out with its report & we won’t mind paying more or less after viewing that report & in no case before that. 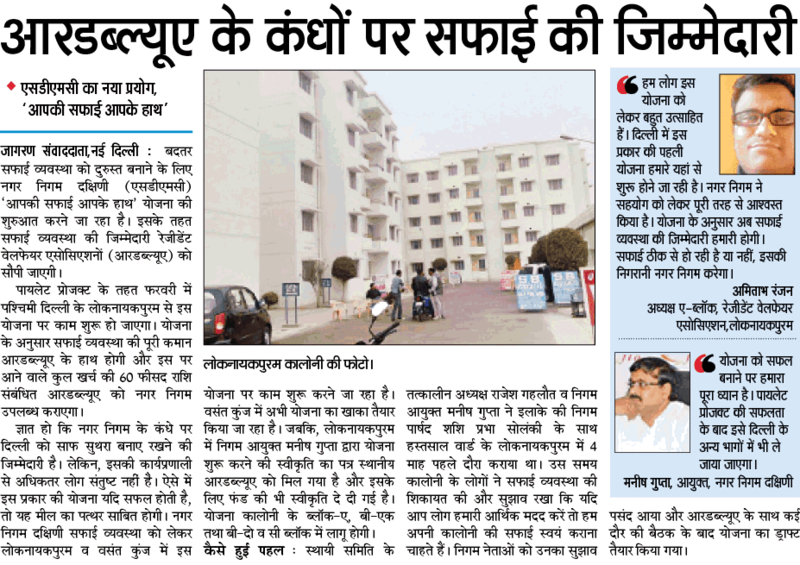 We hereby request to CM Arvind Kejriwal & Dr Harshvardhan to look into it to safeguard the interests of the residents. A group of RWAs & like minded persons. Shocking but Truth : your valued comments awaited. 1. 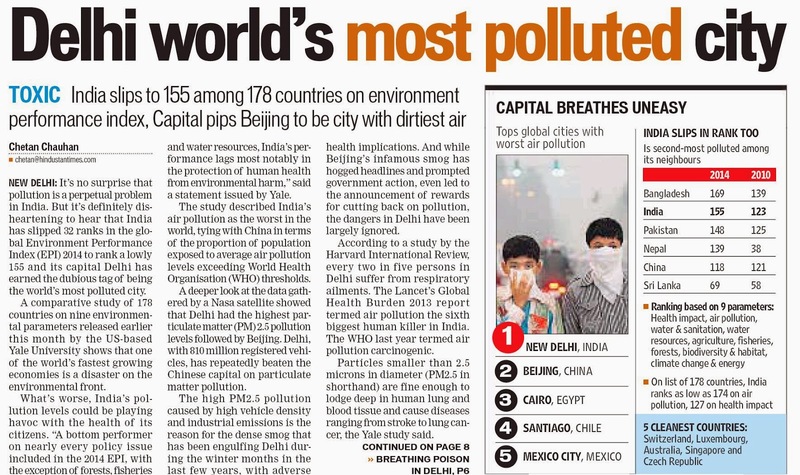 Delhi is world's most polluted city. 2. 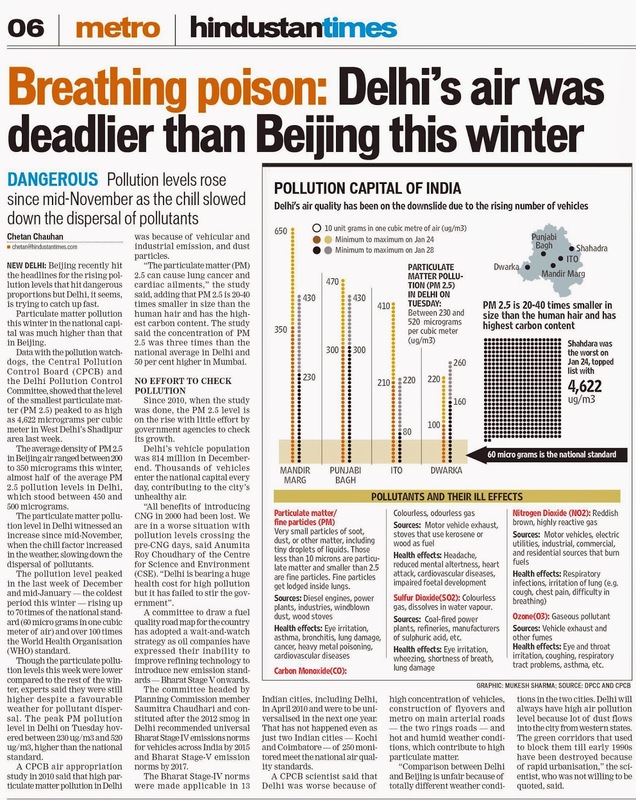 Breathing poison : air was deadlier than Beijing this winter. 3. We are the Proud Delhiites : residents of this very city. 4. What will be the fate of us & our children in this city ? 5. 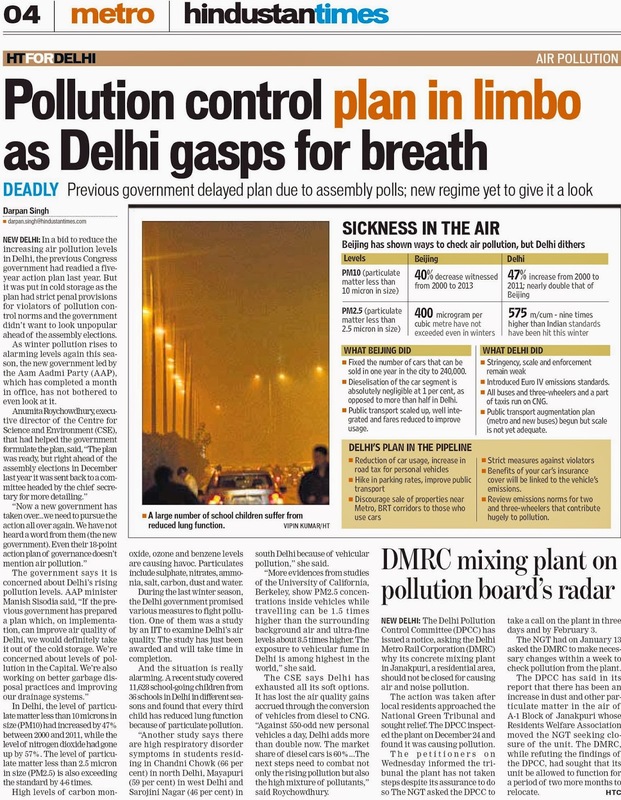 Is there none to look into it or care for Delhiites ? Awaiting your most valued comments. Labels: Shocking but Truth : your valued comments awaited. System of tolerance of inefficiency and corruption ! We all are gifted with many adavantages,various facilities and numerous opportunities for self improvement of the existing amenities.But we have the deadly virus in us ,namely lethargy coupled with indifference and sometimes ignorance .Compared to other localities and RWAs, Anand Vihar is a highly privileged residential haven locality . I feel a band of dedicated,committed,capable,efficient senior citizens who have time to spare ,along with young students can come together to take up activities that will plug the loopholes in the existing system of facilities and amenities.Such work can be undertaken on holidays and evening hours from the ensuing summer season. I am getting a strong feeling that State authorities, Municipal Corporations etc are no longer interested in serving the citizens but themselves,esp how to amass personal fortune.The system encourages,which is unfortunate. That is why Arvind Kejriwal's brand of fiery politics succeeds,because common man is totally fed up with the apathy of the institutions to do their assigned jobs. Let us bring a revolution by changing the mindset and the system of tolerance of inefficiency and corruption.We must all rise as oneman to protest against corruption ,scams and scandals. Risks are there but they are worth taking. We have to sacrifice drawing room comforts and plunge into the boxing arena if we want prosperity at our doors. 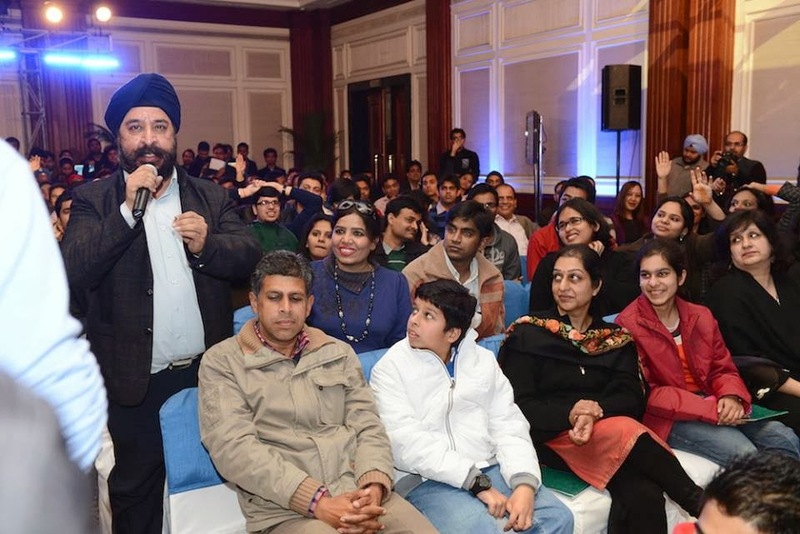 If there are 1000 angry young people ready to do daredevil acts,I am prepared to lead them and fight from the front,even at this old age of 76 years. Labels: System of tolerance of inefficiency and corruption ! 7. Due to DPS school no entry / exist is possible as both entries get choked and this is dangrous needs attention. 8. Along entry point no of cars of Sant Nagar commercial area are parked in colony. Taffic police has put no of display boards but no implementation by taffic police. Anand Vihar, the second biggest cooperative housing society, the first one being Surajmal Vihar, in East Delhi, is endowed with all facilities and needs normally expected by people who are residing and wish to shift to this most sought after colony from all corners of Delhi! Of course the colony has its own darker spots too, which cause and expected to cause, with the passage of time, a lot of problems to the residents! On the brighter side, the colony founded in 1975, covering an area of 90 acres of land bestowed by the DDA and divided into four blocks for residential and provided requisite sites for institutional and other purposes. It has a record number of 903 independent residential plots, which are now growing into a ‘flatted’ colony, accommodating over 20,000 young and old people, with a total greenery environment! The colony has 14 parks, big and small, a neighbourhood park and two slots of ‘green belts’, both maintained by DDA, 5 tot-lots, 7 schools, right from nursery to senior secondary; DDA markets in each block, almost all nationalized and private banks, in and around, hospitals and nursing homes, a community hall and club for recreational, social and cultural activities, a post office, police station etc. and last but not the least, considered to be a ‘transport hub’ with railway terminal and suburban stations, ISBT and DTC buses and metro trains, unheard of at any one location in Delhi! It is difficult to compare in contrast any other residential areas in Delhi! To manage and extend all assistance to the residents, the RWA, known as the Railway Board Employees’ Cooperative Society Ltd., registered under the Delhi Cooperative Society Act way back in 1961, is functioning effectively and efficiently, with no rancor or rival, for the last over four decades, in an admirable manner and inimitable style, with accolades and appreciation of one and all, including the Govt. agencies. To keep in touch will residents, in and out, the Society publishes a ‘Residents’ Directory’, with all requisite details, supplemented with a lot of information and data, for ready reference by the residents, besides a booklet containing the ‘List of Members’ of the Society with their registration nos., dates of birth, contact nos. etc., to greet and meet each other, with the munificence of one of the founder Secretaries of the Society! The local MLA and Councillor also patronize the colony in many ways within their powers bestowed by the local Govt. Of course, the Society has also taken a number of laudable measures towards the security and safety of residents, but despite all such steps, dacoity, thefts and rampant chain snatching continue to take place, mainly perhaps due to its extensive area and innumerable outlets, in all directions, and proximity to adjacent state territory, beyond the capital’s jurisdiction!! On the flip side, of course, there are many problems, built-in or otherwise, being faced by the residents. These form the ‘darker side’ of the colony, with no short term solutions in sight! The colony has one of the few biggest overhead water tank constructed in seventies and utilized till early eighties, but now abandoned to be demolished for which no action has been taken so far by the authorities concerned which may cause a havoc and calamity in the colony if it crumbles and fall! The parks and markets are not maintained properly and cleaned as a regular measure by the authorities concerned, but thanks to a few ‘Samaritans’ who are passionate about their maintenance! Owing to extensive building activities throughout the colony, the streets are strewn with malba etc. causing a havoc to cleanliness of the roads. Uncleaned storm water drains in front of houses cause overflowing of dirty water, making it a fertile ground for growth of mosquitoes and their attended menace! With the vertical growth of the colony, parking of vehicles is assuming a bigger problem congesting the colony roads and lanes and leading to many a time vocal and physical combats amongst the people. No action whatsoever has been taken to remove encroachments on roads with kitchen gardens, barricades and elevated ramps, accentuating the parking problems further! Added with the colony’s ‘vertical’ growth, shortage of electric power and water problems, manifest in many shades and hues! There is no place for children to play inside the colony and the school authorities refuse to let their playgrounds being used by them, outside the school hours, despite a mandate from the DDA in this respect, while allotting the school plots to their management! With the expansion of the railway terminal on one side of the colony, commuters to the terminal pass through the colony in all modes of transport, making it a thoroughfare, disturbing the peace and tranquil atmosphere of the Vihar! Of course, all this and more, are creation of humans and could be solved smoothly and successfully by the agencies concerned if they pay adequate and desired timely attention urgently! 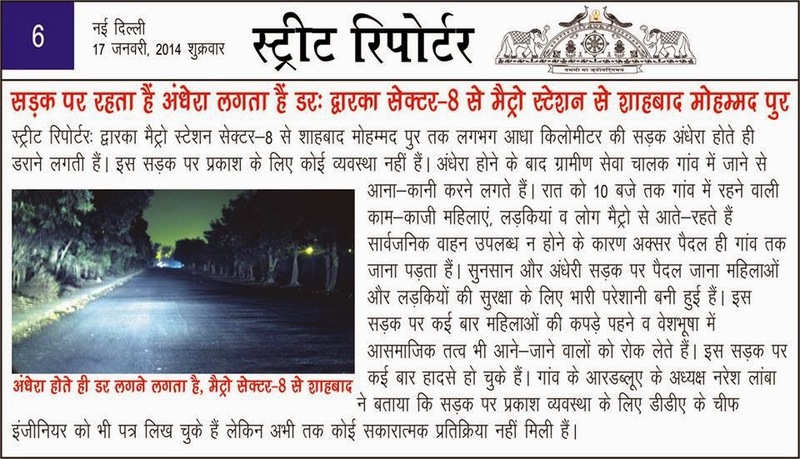 Sub:Suggestion to increase the average speed of traffic on ring road from Maharani bagh to Dhaula quan. A-7 East of kailash new delhi 110065. Venue : ARSD College, Ring Road, Dhaula Kuan, New Delhi. We are organising 13th 'Rotary on the Spot Poster Painting (+ one line message) Competition' as per the details mentioned above. This competition is organised every year where more than 3500 children participate from all the schools of Delhi and NCR. Entry is free & open to all children. These paintings would be used for exhibition/ publicity for creating awareness in the society. Participation Certificate, Polio Cap & refreshment will be given to all the children. 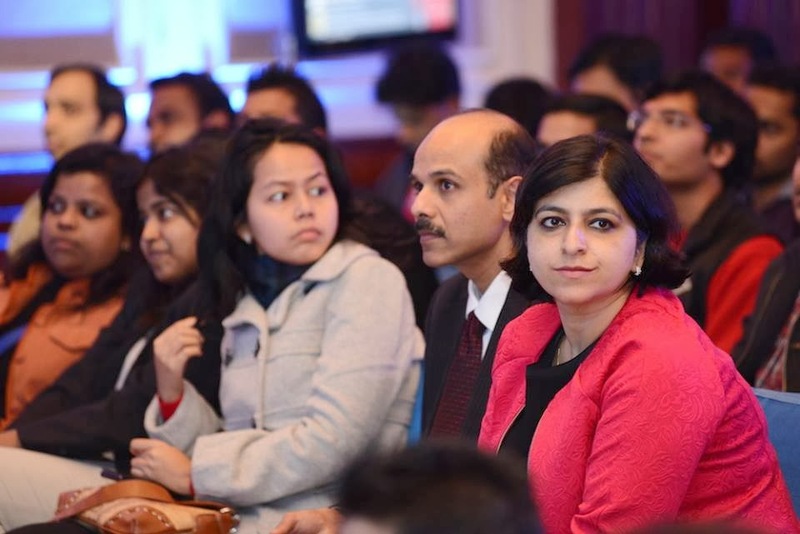 15 prizes per age group will be awarded, the entries will be evaluated by a panel of eminent judges. The judges’ decision will be final and binding. Awardees will be felicitated at a separate function later. You are requested to inform to the ,Art teacher and the students of the school about this competition. We are attaching the posters of the event. There is no limit to the number of students participating from a school. We hope students from your school will participate in this competition. School with the Maximum number of Participation will be Awarded. In case of any query or suggestion, please feel free to contact any of the co-ordinators. Message received from Sh Watwani ji. Elections in 2014 are very close to us.We must choose right candidates as MP s and the right Party must win to avoid a hung Parliament-if not done we will witness horsetrading of MPs to get power by coalitions. We are yet to see selfless,honest,service minded MPs in our political scene. Men of character are of endangered species! almost all MPs are not bothered about preventing scams and scandals. a general frenzy prevails encouraging loot of money belonging to the public and the govt. Non performing assets of public sector banks have reached mind boggling heights due to connivance of Banks Heads and politicians in disbursing huge amount of loans to dishonest borrowers of doubtful integrity.Such loans are written of as nonrecoverable.I wrote to the Governor of RBI.No response from him. Airindia is loaded with debts to Boeing airplane companies and our airline is operating under heavy loss. markets of profit earning routes wer given away by our aviation ministry deliberately to Jet air and emirates.reason is to get kickbacks for private pockets. Let us stop all such heinous malpractices.Our MPs barring a small group will not ask questions because they are also beneficiaries. Can we all meet under the banner SMASH -SOCIETY for MOVEMENT AGAINST SOCIAL HORRORS -? Kindly come forward,we all have to wake up from our deep slumber plus lethargy,inertia and indifference. I await a massive response. we will win if we decide to protect the future of our progeny. THIS IS TO INFORM YOU THAT PWD HAS CONSTRUCTED THE DRAIN OUTSIDE NAVRACHNA APPARTMENT IN EAST ARJUN NAGAR. THE COVERING OF DRAIN WORK WAS LEFT IN MIDWAY BUT AFTER CONTINUOUS PURSUATION THE WORK WAS COMPLETED.BEFORE COVERING THEY HAVE DESILTED THE DRAIN. SORRY TO SAY THAT DESILTED MATERIAL IS LYING NEAR THE ENTERANCE OF NAVRACHNA APPARTMENT UNDER WARD NO 225 IN EAST ARJUN NAGAR. WE ARE WAITING FOR THE SMALL WORK BUT WE ARE AT THE MERCY OF PWD KARKARDOOMA DIVISION. We have been operating in sector 7, market -2, R.K.Puram, New Delhi – 110022, more than 45 years and never have faced this kind of problem which we are facing from past 20 days. The RWA of sector 7 has forcefully closed Six main entry gates of the colony through which people commute within the sector and market. Due to this forcefully closure of the gates we are losing business every day and it is difficult for us to operate with the entry and exit point being closed. The main gate just next to the market has been sealed completely which is illegal according to the letter D/664/SE(P)I (attachment) of Municipal Corporation of Delhi, Engineering Department. The Gate should be kept open from 5:00 a.m. to 11:00 p.m in the night. We have visited to the area SHO with this problem but they simply refused to help in this regard in any manner. We have tried talking to the RWA regarding this issue but they have refused to carr out any talks with the market association, and said that they will not allow opening this colony gate at any cost. We request you to kindly help us in this regard. Share with us activities of your RWAs. It can be any article / news / pics published in any news paper or pics / vids clicked by you as a routine, for remembrance. Just share with us pics of your Achievements, Medical camps, Sanitation drives, Social activities, Meetings, Cultural programmes, etc. etc. 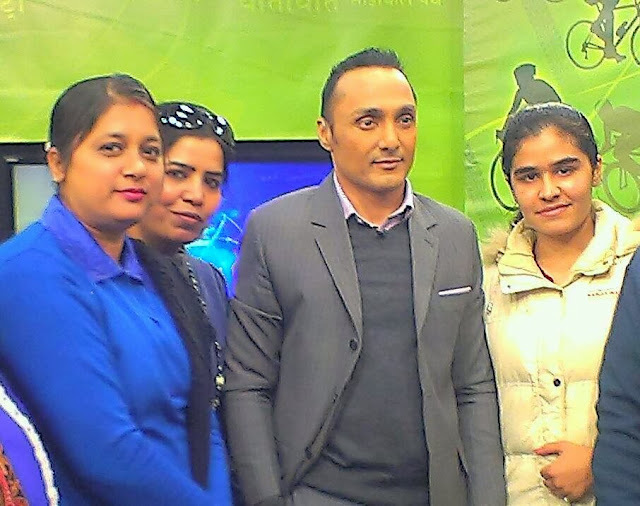 & we will try our best to upload it on the RWABhagidari Blog. Remember, RWABhagidari Blog, now has the widest reach to a large number of RWAs of Delhi & you can definitely reach alongwith to all these locations for spreading awareness on your range of activities. Nokia Lumia : My APP idea is the BEST SELLING idea Worldwide ! 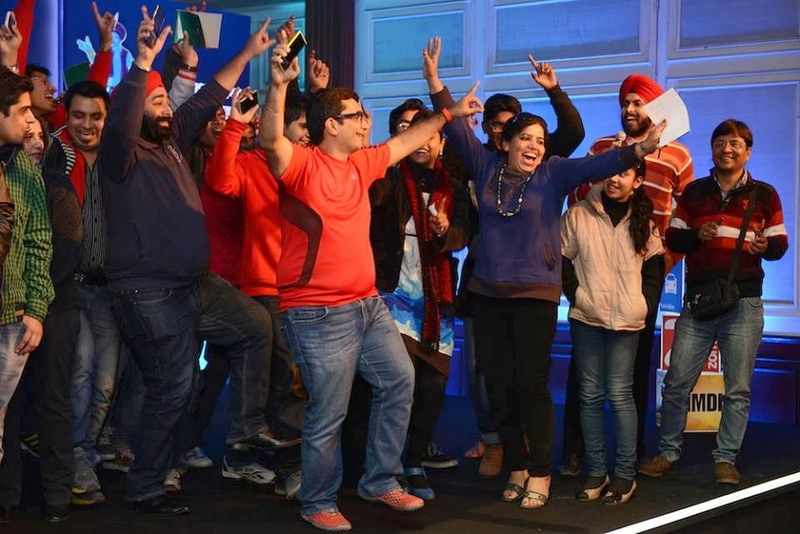 Nokia Lumia : Your wish my App – Season two : A nice Indiblogger evening with Chef Vikas Khanna, Rajiv Makhni & Vishal Gondal alongwith Nokia Team. MY APP IDEA IS THE BEST IDEA & in case NOKIA could implement it, it will be the BEST SELLING idea worldwide. Every city has so many problems. Be it water logging during monsoon, No water or dirty water in summers, Bad roads, Pot holes, Cave ins, Garbage, Stray dogs, Street lights, Power outages, Chain snatchings, Eve teasing, Traffic jams, Fire services, Ambulance, Medical emergencies, etc. etc. & so on. Mostly we don’t have any INSTANT direct telephone numbers to connect with the concerned authorities & in case we have the Tel numbers, these are either busy or just keep on ringing. I want a NOKIA APP where we have to just upload our complaint & it will automatically reach to the concerned authorities. Moreover, it will continuously be shown as the PENDING COMPLAINT unless & until it has been resolved. These problems exist in almost every country, every city, every locality, every street though problems may change to Hurricanes, Katrina, Tsunamis, Earthquake, Volcanos, Icy cyclones depending upon the location of various countries. So the APP can be so designed, that even while in the roaming, if you find any such problem anywhere & if you upload your ISSUE, it will automatically reach to the authorities of that area itself. ALMOST EVERYONE REQUIRES THIS KIND OF APP WHICH CAN BE USED TO RESOLVE THE LOCAL ISSUES AS WELL TO MEET ANY KIND OF ENERGENCIES. Come on NOKIA, I know you can do it. More can be discussed when we have a meeting in this regard. Labels: Nokia Lumia : My APP idea is the BEST SELLING idea Worldwide ! Explanation sought from CM over Water meters ! 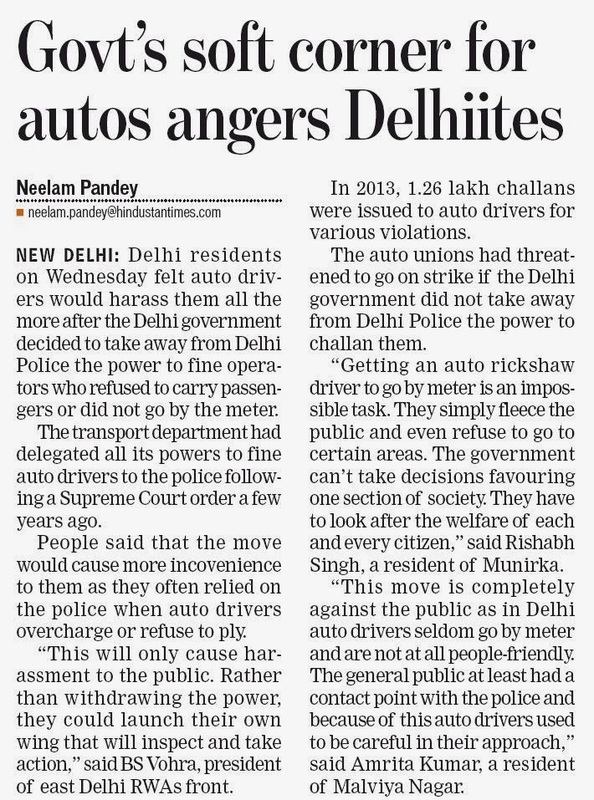 CM Arvind Kejriwal stated on Monday that "I have asked DJB to see what kind of meters these are. If they are so sensitive that even blowing into them shows a reading, then people will be paying for air and not water. Nobody should be forced to use these meters,". We want the explanation from CM that what does he mean by IF. While he himself created the scene few months ago, he never used the word IF. Moreover, what does he mean by FORCED ? Does it mean that those who are unaware, will still get these meters & will continue to pay for AIR & not WATER ? Am I a stuck record that no one is willing to listen ?????? At least Shiela Dikshit thought so, to her own and many good congressmen's' Peril. ....... well someone in Kejriwal's office is hell bent in throwing him off the sent in the issue of Fast Running Meters. You may remember my OPEN LETTER a few weeks back where I had informed the CM that Testing the Meters will be a Futile Exercise. Unless the issue of RESIDUAL BACK FLOW IN COMMON NEUTRAL is addressed the DAYLIGHT ROBERY cannot be Detected. Or he too wants it to be an EYE WASH - I wish to inform you that during Shiela Dikshit's time DERC had ordered a six month Meter Testing Drive in November 2009 and nothing had come off it. I have in my possession a copy of the Letter I had written to the then Chairman of DERC Mr. Brijender Singh that the Meter Testing Drive will be a Futile Exercise if only the Meter is tested, as the fault lies in the Distribution System with Common Neutral. NOW KEJRIWAL has ordered an expensive TEST DRIVE involving Institutes of Repute who will obviously come to the conclusion that the Meters are fine and RIDING ON THE REPUTATION OF IIT's burry the issue of Fast Meters forever ...... EYE's WASHED. Amongst those reading this mail will be AAP Members or Supporters, Activists, Media friends, someone ...... SOMEONE please tell me to stop mailing NONSENSE ...... Kejriwal like Shiela knows best ....... or if you believe that there is Merit in the RESIDUAL BACK FLOW argument and deserves to be investigated ..... then PLEASE ASK KEJRIWAL TO LISTEN. Open letter to the CM Mr Arvind Kejriwal ! Labels: Open letter to the CM Mr Arvind Kejriwal ! Two weeks after Arvind Kejriwal and his cabinet were sworn-in to form the Delhi government, dna asked several resident welfare associations in the capital to assess the new government's work. अरविंद केजरीवाल ने दिल्ली की सरकार भी बना ली और एक बड़ा काम भी कर दिया कि बिजली डिस्ट्रिब्यूशन कंपनीज़ के CAG ऑडिट का ऑर्डर दे दिया. इसका हम खुले दिल से स्वागत करते हैं. 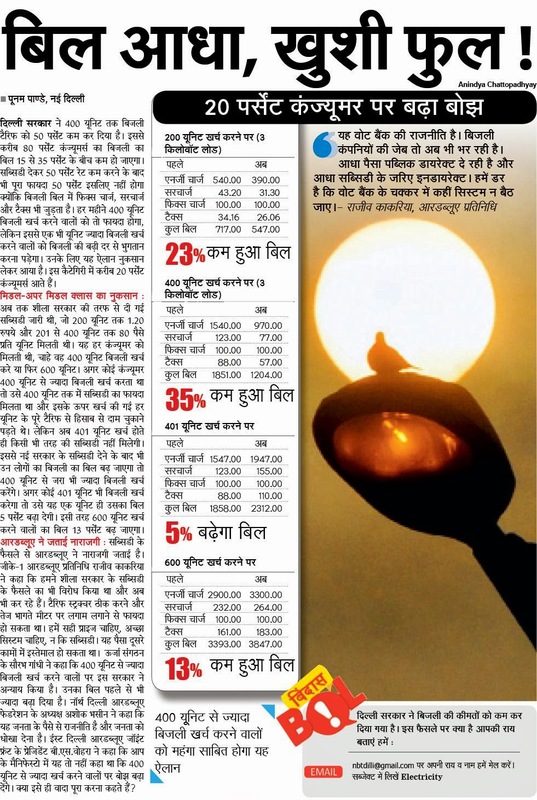 लेकिन बिजली के दाम कम करने का जो उनका प्रॉमिस था वो तो बेकार साबित हुआ क्योंकि उन्होने सिर्फ़ 400 यूनिट्स तक के यूज़र्स को रियायत दी और उसके उपर वालों को मिला सिर्फ़ बाबा जी का थुल्लु. इसी तरह जो उनका 700 लिटेर मुफ़्त पानी का स्टेट्मेंट था, वो भी सिर्फ़ एक मज़ाक बन कर रह गया. 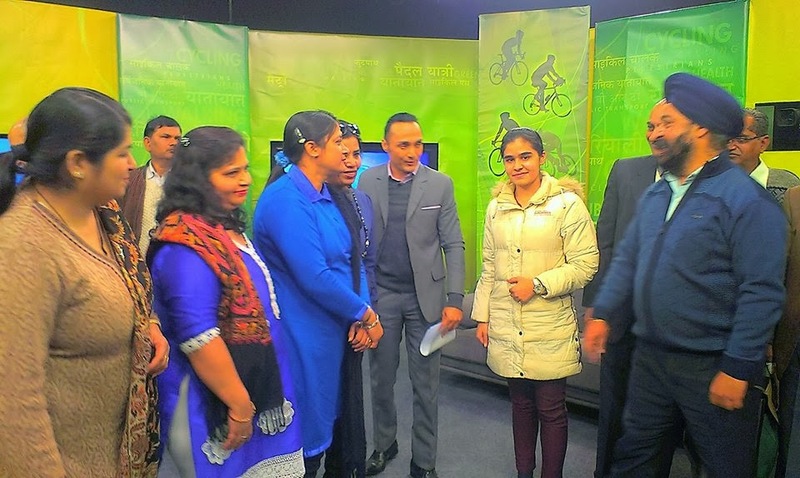 अगर आपने 700 लिटेर से उपर उपयोग कर लिया तो ना केवल आपको सारे पानी का बिल देना पड़ेगा बल्कि उसके उपर जो 10% दाम बड़ा है, वो भी देना पड़ेगा और साथ में 60% sewer चार्ज भी. यानी की, अब 'आप' के सहयोग से, आप के पास, सिर्फ़ एक काम बचता है कि अगर आप बिजली और पानी के पैसे बचाना चाहते हैं तो कृपया सुबह और शाम अपने पानी और बिजली के मीटर को देखते रहो कि कहीं रीडिंग ज़्यादा ना हो जाए. इसके साथ ही अगर बे मौसम के पड़ोसी या रिश्तेदार टपकने लगें तो समझ लीजिएगा की उनके पानी और बिजली की रीडिंग पूरी हो चुकी है. A Group of RWAs & like minded persons for United & Timely Voice. Voice of Delhi - A group of RWAs & like minded persons ! Please join us to make it a united & timely voice. 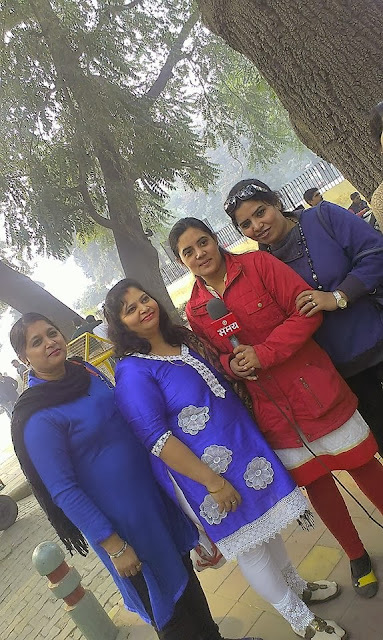 Labels: Voice of Delhi - A group of RWAs & like minded persons !